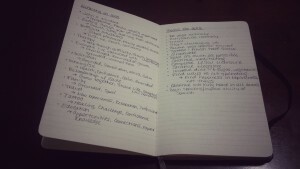 Continuing with the last post about reflecting on the year and setting goals for the upcoming year, I thought it might be helpful to share some tips on journaling. There are so many ways to reflect and set goals, but I find that writing them down makes a substantial difference in effectiveness and allows me to take ideas deeper than is capable with just processing them in my head. Making reflection and writing part of your daily (or at least weekly) routine can have some major benefits, including understanding yourself better, feeling more grateful and positive about life, and increasing your success in achieving goals. So, whether you’ve been writing for awhile or are considering starting, here are some tips to take your ideas a step farther. Story Book: A storybook can be used in multiple ways, such as reminiscing about past experiences and writing them down to keep a record or help make sense of a crisis or unresolved situation. By writing experiences down, a beginning, middle, and end can be organized to create a cohesive story and allow for some distance between the situation and yourself, which can provide a clearer perspective. Worry Book: This is a great way for those who suffer with stress and anxiety (so everyone!) to list problems and create small steps that can be taken to address the situation. Being able to see the worries on paper, outside yourself can decrease stress, then making a plan gives you a feeling of being in control of the situation. Gratitude Book: A gratitude book can also combat anxiety and stress, as well as depression by giving you the space to find the positive things that are happening in your life. Even if you’re not experiencing depression, anxiety, or stress, taking a moment to reflect on the positive things that happened that day is a fantastic way to feel a sense of balance and promote a happy life. Log Book: Log books are fantastic for keeping you organized and on track with goals. Keeping a planner with small goals for each day has been an amazingly productive exercise for me. Being able to set small goals keeps you on track to achieve bigger goals and provides a sense of accomplishment when you see all that your been able to complete that day. Use a logbook to keep tasks organized, set goals, or chart progress. Scrapbook: When words aren’t quite coming to you or you find something that has meaning, a scrapbook might be a great way to keep all your thoughts together in a more visual way. Technology has made this kind of journaling pretty easy with the ability to safe, post, and share all the material our hearts desire. One way that I keep a scrapbook is by collecting quotes I find meaningful into one location. It’s great to come back to for inspiration or reflection on what I might have been going through when a certain quote had meaning for me. Start with a meditation: Before writing, it can be really helpful to just take a minute to center yourself where you’re sitting by taking a few deep breaths (bonus effects for closing your eyes) and reduce distractions. This allows you to focus and calm the mind to begin writing. Keep your writings organized: This is one of the biggest challenges for me. I tend to write things down on whatever I have on hand, then find that I my writings are scattered or I’ve lost some. I’ve been able to (almost) fix this problem by keeping a small notebook with me at all times that is strictly for journaling. Another way to do this is to keep multiple journals or files, if you want to have distinct holders for different types of journaling. Write Freely: Writer’s block can be such a barrier for getting ideas and thoughts out into a journal. To combat this, write quickly and write truly. By writing quickly without taking long breaks, you can get ahead of the writer’s block. And, write truly by just writing down whatever is in your mind, even if you’re worried it’s incorrect or it may sound awful. Journaling is for you and you only, so allow yourself to make mistakes and let out the worst side of you. You might be surprised what happens when you allow this process to happen. This leads into.. Protect your Privacy: As I said, keeping a journal is for you and you only. You don’t have to write for others, and others don’t have to see what you write. By keeping a journal private, you’re far more likely to be true to yourself, because you’re going to be less worried about the social stigma of what others think of you. This will allow for much deeper, truer writing, which in turn leads to a better understanding of yourself. Write about Emotional Experiences: Allowing yourself to write about an experience that carries a lot of emotions for you can yield tremendous benefits. By allowing yourself to write out an experience that is emotionally charged and be honest about your feelings can be truly therapeutic. Be cautious, though, and only write about experiences or emotions that you’re ready to handle. It might be a good strategy to begin with a part of the experience or one emotion you have about it, then work through it in stages. If you’re struggling with something, this can be a powerful way to process the experience and better understand the meaning it holds in your life. If you’re on board with keeping a journal but struggling to get started, here are a couple of starting points. Scheduled Writing: Take 10 minutes every morning or at the end of the day to write whatever comes to mind. Maybe this will be goals you want to accomplish that day, three things you’re grateful for, or a memory you want to reflect on. Scheduling journaling into your routine is a great way to hold yourself accountable and set aside time specifically to write. Three Gratitudes: This was mentioned, but at the end of the day you might take a minute to jot down three things that you’re grateful for that day. Again, this is a great way to decrease anxiety and depression while improving balance and happiness. Challenge yourself with this by writing new things each day! Firsts: Take a few minutes to write down all the details a of first. Maybe a first day on the job, first date, getting your first pet, writing your first journal entry. Is journaling a part of your routine? Are there other strategies that you find helpful in your writing? If you haven’t journaled before and plan to, let me know how the experience goes. I followed these instructions and my journal caught on fire. I love this post! I have fallen out of the habit with my own, and need to get back in it. It does put a different perspective on my day.